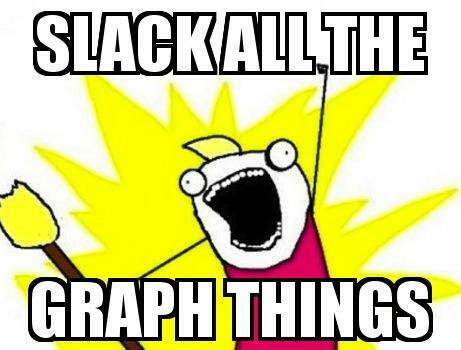 Build a Slack and Neo4j integration to demonstrate how useful a graph database backend would be. And, of course, how much fun. Our colleague Andreas, who loves Slack and brought it into our company, suggested the other day that we could build a Slack and Neo4j integration to demonstrate how useful a graph database backend would be. And, of course, how much fun. In the process of making the integration, we came up with some surprisingly useful benefits. More below. As it was only midnight we, the amazing Nicole and Michael, decided to put something together. We set up a Neo4j 2.2.3 instance in the cloud. Then, we created a Python app for our Slack-Neo4j server and pushed it to GitHub. The application uses web.py for the webapp, requests to access the Slack APIs and py2neo to talk to Neo4j. Next we pushed it to Heroku to make it available publicly so that Slack could connect to it. You have to provide environment variables to your Neo4j server, your Slack API token and the team token configured with your slash command. Find the details in the project readme. Implementing the app was straightforward. Parsing the POST payload and checking the team token, we then got the first word of the text parameter as “command” to dispatch on. Sending requests to the Slack API with the token and getting the JSON response is straightforward with requests. We then passed the JSON response directly as parameters to a Cypher statement to create the graph structure in Neo4j. As you can see, we can import users, channels and memberships, easy peasy. Finally, the biggest surprise of all: We wanted to recommend new channels to people. We used traditional collaborative filtering for this concept of “channels of your colleagues that are not yet your channels”. But we also filter out prolific users and channels so that they don’t distort the picture. We hope this integration between Neo4j as a open source graph database and the collaborative wonder-tool known as Slack will make it into the community Slack integrations page.